The founder of Matsubayashi-ryu was Grand Master Shoshin Nagamine. He was born on July 15, 1907 in Tomari (Naha City, Okinawa) and passed away on November 2, 1997. His most important masters were Ankichi Arakaki, Chotoku Kyan (known as “little eyed man”) and Choki Motobu (Motobu the mokey). Sensei Kyan was a disciple of Sokon Matsumura (1809-1896) and sensei Motobu was a disciple of Kosaku Matsumora (1829-1898). Therefore O´Sensei Shoshin Nagamine was the third generation in the transmission of training methods coming from these two great masters. 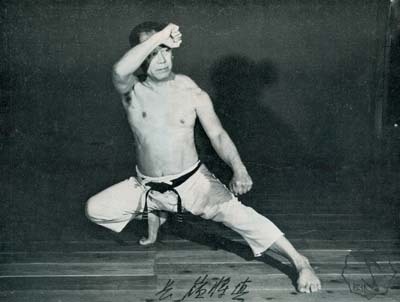 In honour to this fact, in 1947 O´Sensei Nagamine decided to name his karate-do style Matsubayashi-ryu. By reading the characters, Matsubayashi-Ryu means “School of the Pine Tree Forest”. 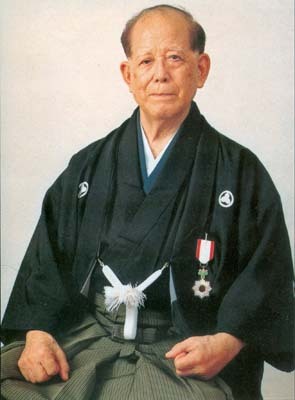 In March 1977 O´Sensei Shoshin Nagamine was honoured and distinguished as living treasure by the Okinawan Government, distinction supported by the Ministry of Culture and Education of Japan. Important cultural assets that O´Sensei Shoshin Nagamine left us are four books written by him in which he describes the art of karate-do and its deep relation with the practice of Zen. After creating the Matsubayashi-ryu school of karate (1947) more than one hundred dojos were created in different parts of the world, to practice the art of karate-do thus conceived.